Here is a suggestion for last minute Santas. Giving an orchid plant reminds that person of you as the plant keeps blooming and brightening the room. 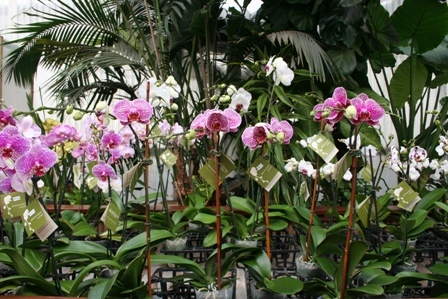 The orchids pictured above are phalaenopsis/moth orchid. They are lovely to look at and easy to care for. Native to the Asian tropics, they thrive in bright forests under the canopies of trees. They love the great indoors of homes blooming in sunny rooms away from indirect light. Their ideal temperature range is 65 to 80F.